The Angelcare Baby Monitor is not your typical baby monitor. Instead of just monitoring the sounds a baby makes from a distance, the Angelcare monitor allows you to monitor your baby's actual breathing movements. When the monitor stops detecting movement, possibly because of the baby not breathing, an alarm sounds. Although setting up and using the Angelcare monitor takes a bit more work than a traditional baby monitor, the process does not take long. Prepare the crib for the sensor pad. The sensor pad needs to rest on a completely flat, hard surface. 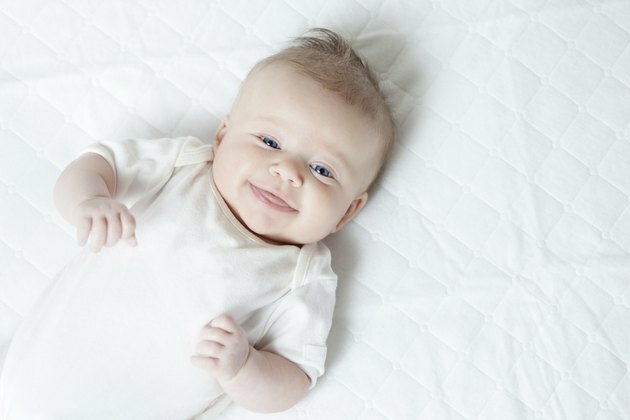 If the bottom of the crib does not have this type of surface, place a thick plywood board to cover the full dimensions between the crib base and the mattress. This will ensure the sensor pad will keep appropriate contact with the mattress and your baby's movements. Install the sensor pads under the mattress. With the printed side facing up, place the sensor pad under the crib's mattress in the middle of the crib. No bedding should be between the mattress and sensor pad. Secure the sensor pad using a tie wrap. The cord of the sensor pad should pass beneath the mattress and run along the floor so that it will be out of your baby's reach. Install the nursery unit. Connect the cord of the sensor pad and the AC adapter cord to the nursery unit. Plug the other end of the AC adapter into a power outlet. Also insert the batteries into the unit for battery backup, in case of an electrical outage. Install the parents' unit. Connect the AC adapter to the parents' unit and plug the other end into an electrical outlet. Insert the batteries included with the unit. Allow the unit to charge for 15 continuous hours before using the monitor, according to the Angelcare monitor instruction manual. Set up the nursery unit and parents' unit. Turn both units on. Program your desired functions. All functions can be found under the "Menu" button. Different options can be viewed by pressing the "Up" and "Down" arrows. The option can be selected by pressing the "Select" button. Test it out. To test the sound, switch the parents' unit to the "Sound Only" option and have a helper go into the room with the nursery unit and make a noise. To test the movement option, switch the parents' unit to the "Movement Only" option and gently move your hand on the crib mattress. The pendulum icon on the nursery unit should flash green as you do this. After verifying the green light is flashing appropriately, remove your hand from the mattress and listen for the alarm. The pre-alarm should sound after 15 seconds and the actual alarm will sound five seconds after that. Put your hand back on the crib mattress and look for the alarm to stop and the green light to resume flashing. If the Angelcare monitor does not seem to be working properly, consult the troubleshooting section of the Angelcare instruction manual, make the appropriate adjustments and retest the monitor until you can confirm it is working correctly. Although the batteries are not included in the nursery unit, it is wise to buy your own batteries and use them in case of a power outage. The Angelcare monitor is not a medical device. The Angelcare monitor should not be used as a substitute for appropriate parent supervision. Do not put the parents' unit near wireless devices or near microwaves, as this may disrupt signal transmission.